I decided to blog about another bird that I found. 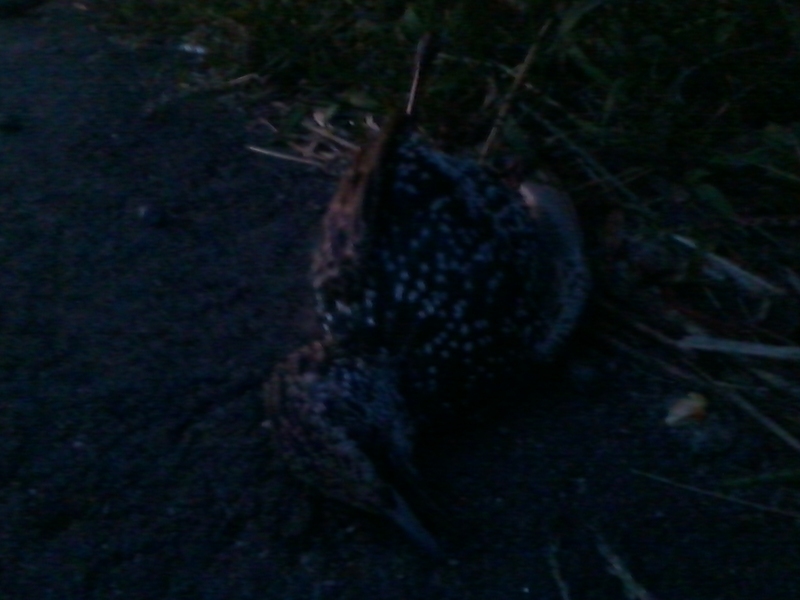 I found this European Starling dead on the side of the road on my way home from my mom’s restaurant. It doesn’t appear that it was hurt or anything, however, since this bird was on the side of the road, it must have been hit by a car. It looked so similar to another European Starling that crashed into a classroom window. I made a blog about that a couple months back. I never took any pictures of it, and my mom deleted all my cell phone videos so I had to be descriptive in words last time. Well, I managed to take a picture of this one. 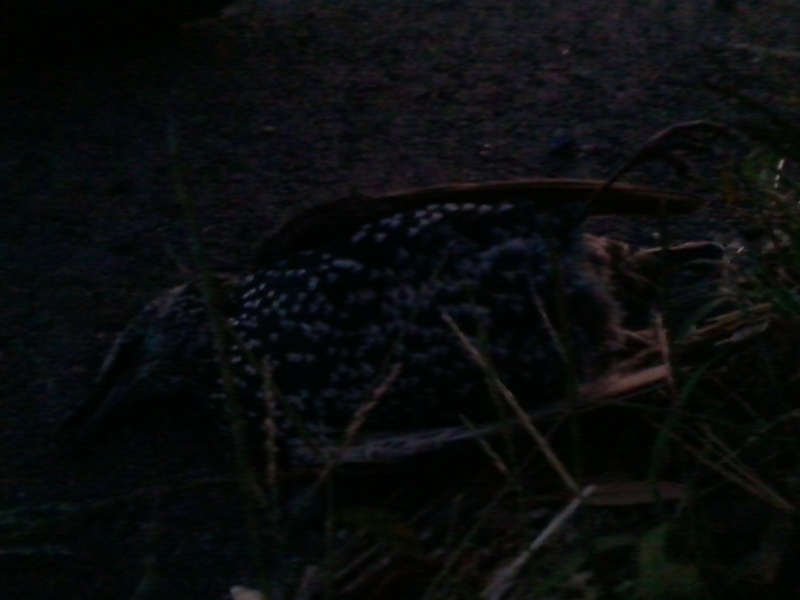 Here’s the starling that was hit. After I took those pictures, guess what I did? I touched its wing. I actually did! It felt so strange! It put my finger on it, then I jumped up and went “Oh my gosh, I touched it, eww!”, then I started pedaling away. I then turned around, and then I did something else. I decided to see if I could flap its wing. I couldn’t. It was like….stuck. It felt like a robot. It didn’t seem real. It was a feeling that I never experienced. It was lifeless, like a machine. It’s like a toy………not really of course! I then messaged my friend Darian03 about that. I spent about 15 minutes typing the message, then once I clicked “send”, I thought to myself, “I just got to go back there again!” I did. I bike rode back there and I decided to try to flap its right wing again. I guess I didn’t pull it hard enough last time. I took that wing and pulled it, and the wing started to rotate until it was all the way out. I could barely believe that it was actually coming out! I did the same this for the other wing. I flapped them both out. It felt like paper, although I was just feeling feathers. This is something I never experienced before. I mean, this is like a ONCE IN A LIFETIME opportunity!!! I wanted to do that so badly last time, but I never did. I felt powerful once I was doing that. That starling seemed to be alive again, in a way. It seemed to be full of life, flying again once I saw that those wings were all spread out. I’ve never touched a bird before, well, at least not a wild bird. My friend’s mom has a lovebird and I had a chance to pet it once. That was the only other time though. This time was different. I felt in control now. I felt that control once I flapped the wings of that starling! Then I let go, then the wings immediately closed back automatically. I don’t know why it closed like that, I guess that bird just had its wings like that when it died. It probably had to keep it in because there was no contraction at the time. I’m letting go of something, although the saying always goes “Don’t let go!” Annegrace has a song called “Don’t Let Go”, and I really like that song a lot, and this is going to always make me remember it. I washed my hands once I arrived home of course. Some of us may not know this, but European Starlings carry the most diseases of any other bird. It’s true, and they are the leading cause of a lot of the major flu type diseases such as the bird flu. I am always careful when it comes to touching things like that, especially if its something that is dead. I’m learning about poetry in my English Comp class. There was a website that talked about these starlings. William Shakespeare sent these beautiful birds here to conquer the New World. It’s a shame some people can’t appreciate these birds more, like he did.